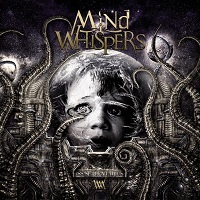 MIND WHISPERS is a Melodic Death Metal band from France. “Serpentarius” is their fifth full-length record. To start out, this album sounds good. The intro is nice, and the opening to “…Star” is great. But then you get into the song. After a while, this riff plays that has the most annoying repetition ever, and it repeats about sixteen times before it finally ends (not including the times it makes a reappearance). When it comes to Melodic Death Metal, I’m okay with bands that have keyboards and orchestras and still make the guitar shine. What I’m not getting with MIND WHISPERS is the guitar. When I hear their music, I hear orchestra and keyboards overpowering the guitar while growled vocals mutter underneath it all. As a guitarist myself, the best thing about Metal, for me, are the riffs. I don’t have that resonance with MIND WHISPER. This is one of those acts where the driving force is the orchestration and keyboard. While these are cool elements, it does not sound good when they are as prevalent in the music as they are in this case. It ends up sounding like a wall of noise. Then when it comes to the guitar, the riffs and solos are underwhelming. It’s funny because every song is so predictable that it’s painful to listen to. Listening to “Again” is like watching a chick flick. Yeah, they kiss and then they’re driven apart by a career or ex-lover only to be reunited by premature love and get married. It’s so formulaic at this point that it’s almost unbearable. One thing that I’m finding in their music, especially on “Once” and “…Star,” is this awkward experimentation with time signatures. I’m not going to be the one to say that time signature experimentation is unwelcome in this genre, but MIND WHISPERS does not do it correctly. I guess that would go under the part where I say their songwriting isn’t good. This band’s songwriting isn’t good, and not just when it comes down to instruments. The vocal structure is also terrible. Breizh needs to learn when to not sing. There was this interlude on “Once” that would’ve been good if he just kept his mouth shut. You don’t need to always sing. Let the instruments breathe for once. There’s scarcely a moment on this record during which this dude isn’t growling, and it’s actually suffocating. There is one moment, however, on “Serpentarius” where there’s unpredictability, and the music is actually bearable. Following this song is “Warrior of Space,” a song that seems to not have been infected by the vocal virus, as it actually lets the instrumentals breathe. The multiple interludes featuring classical guitar are very welcome. This song is definitely the least annoying and best in terms of songwriting on the album. As a matter of fact, the last three tracks on this album are the best ones on here. It’s not really saying much, however, they did have the best songwriting and flow of all the other songs here. I have to hand it to MIND WHISPER for at least structuring the album so that the ending was climactic in some way. I was thinking this album was only going downhill, but they got me there. Other than a few average tracks, this album is not worthwhile. It’s Melodic Death Metal that’s so overdone in terms of reaching for melody that it doesn’t even manage to have good melodies. The songwriting is terrible, the musicianship is not represented in the way that it should be, and the music is mostly plagued by mediocre vocals.